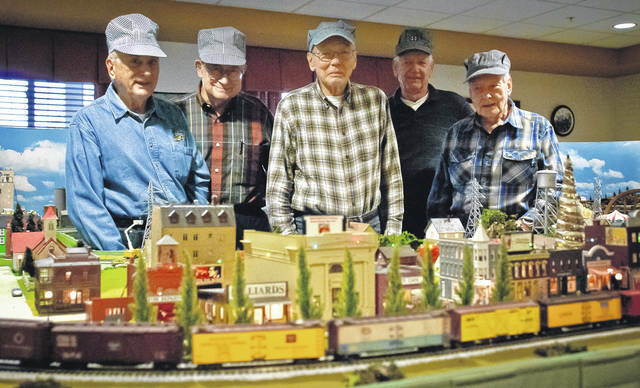 The trains that circle Harrisville are carefully watched over by a group of five model railroaders, from left, Bob Rietz, Wayne Hasty, Don Dillemuth, Jim Schrock, and Glenn Beaber. The group spent three days a week together creating, designing, and building the 183-square-foot model railroad that now occupies the Roundhouse Room of Willow Brook at Delaware Run Retirement Community. When the trains of the Willow Brook and Western Railroad glide along the 150 feet of track around the sleepy little town of Harrisville, the memories of five model railroaders wander back to that Christmas morning when they first found model train sets under the tree. Hasty said in that era the train set evolved from under the Christmas tree to a plywood board, then to the basement, and on and on until it filled every bit of available space. “I was an S-gauger when I was a kid,” he said. The little town of Harrisville is an HO-gauge, 1/87th scale, model railroad designed and built by residents of Willow Brook at Delaware Run Retirement Community. The town is named after Larry Harris, Willow Brook’s chief executive officer. He authorized the space of the Roundhouse Room for the model train enthusiasts. The residents joined forces three afternoons a week to lay track, build, paint, construct electrical hookups, and create contours for topographic features. Don Dillemuth designed the landscape of the mountain and tunnel the trains go through. He wanted an authentic look for his mountain so he used real rocks and natural materials to create it. Hasty said the discussion of building the model railroad began in 2011 and construction started sometime in 2013 with building the tables that support the landscape. The model railroaders said the non-specific post-World War II town is 183 square feet, including a downtown, an industrial area, a small mountain village landscape, and an amusement park. To add to the effect of a working city, the table top model has 195 life-like figures of both men and women, 30 animals, 137 motor vehicles, and 15 locomotives with 60 freight cars and five passenger cars. Hasty said many of the buildings along the main street have finished interiors. He said three of the buildings in the small town are named after his three daughters. “The cafeteria on Main Street is named after my daughter Beth,” he said. Two-thirds of the structures were donated and 20 others were built from model kits by the group. “I don’t know anything about trains,” said Glenn Beaber, one of the model builders of the group. Hasty said the project is a wonderful source of creativity for the group and a stress reliever for caregivers, residents, and their families. The group held a small ceremony Wednesday to name the railroad and incorporate the town’s name. This entry was tagged Bob Rietz, Don Dillemuth, Glenn Beaber, Harrisville, Jim Schrock, model train, railroaders, Wayne Hasty, Willow Brook. Bookmark the permalink.